I crouched in the hospital bathtub, wearing nothing but my sports bra. I’ve always been the girl who would rather contort herself in a bathroom stall than go bare in the women’s locker room, but my nakedness was nothing compared to the pain. The idea of laboring in the tub with my loving husband nearby had seemed luxurious and comforting, even a little glamorous. In reality it was small, cramped . . and crowded. Four sets of eyes watched me as I bore down on another contraction, waiting on me to make a decision about the epidural. Anxious, afraid, I was uncertain: as a survivor of sexual assault, I had mixed feelings about numbing the pain. My waters had broken 12 hours before. 7 pm, at home, on my toilet, as I peed. Nothing glamorous about that. No contractions. Just a strange, slow trickle.Could this be it? It felt so anticlimactic after months of panicked anticipation. Normally this wouldn’t mean much; normally a woman could take her time in the comfort of her own home. But I had tested positive for Strep B and needed to get to the hospital for a round of antibiotics. On top of that, the amniotic fluid was tinged with green, indicating there was a chance my son was in danger of breathing in meconium. There was a risk that he would not be able to cry or breathe on his own. 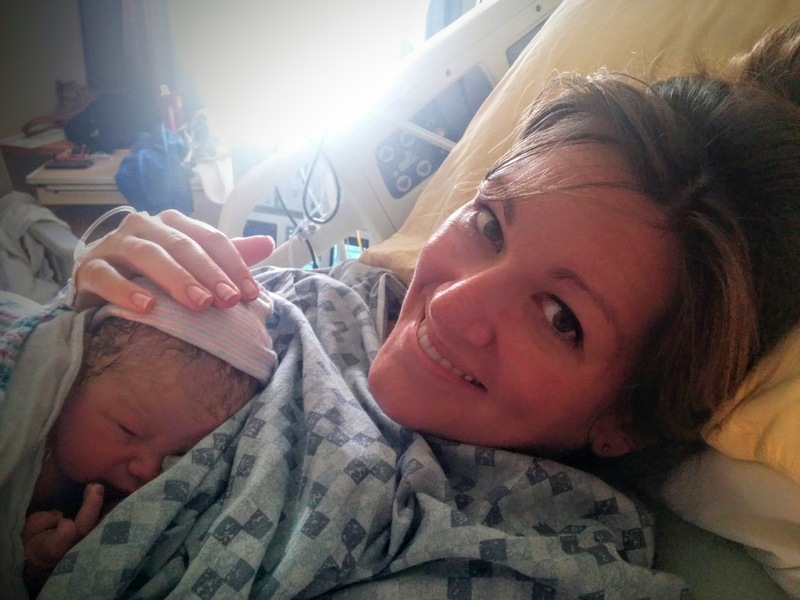 I found comfort in small blessings: my midwife, by my side throughout my anxious prenatal journey, happened to be on call that night; my overworked husband had the night off. I held on to these gifts as a brusque night nurse interrogated me and then told us my plan to try an unmedicated birth was unrealistic. At 10pm I still hadn’t had a contraction. The presence of meconium and its threat to my son meant I’d be on Pitocin by midnight. Time moved slowly and the ache was guttural. My body moved in response to the pain and with every roll of my hips and stretch of my back I felt more rooted to the earth than I had ever been before. There was something primal brewing within me, a timeless song. But against the rhythm of that ancient melody was a frantic thrumming, an offbeat syncopation beating in my brain: No! Not yet! He will tear you apart! No amount of breathing made me feel safe enough to let go. By 6am, hunched over in lukewarm water, I wanted to quit. I wanted my baby more, but I didn’t know how I’d ever get through the pain.My body craved expansion, but my brain threatened to shut it down. I tried to encourage myself. Remember the half marathon you ran? Remember how you thought you’d never make those last three miles? I recalled twisting my ankle at mile 10, falling to the ground and picking myself up in tears and humiliation. I can’t do this, I had thought. It’s too hard. I finished that race, though, and I would finish this one, too. But I was beginning to think I’d need a little help. I looked at my husband, embarrassed and a bit ashamed. “I think I need the epidural,” I whispered. At 7am there was a shift change. My trusted midwife, who had acted more like a doula than her job required, would be going home and I’d be put into the care of a woman I had never met. The new midwife had a quiet, calm demeanor. She was older and exuded a sense of motherly wisdom. I knew in my core I would be safe in her hands. But when she said she needed to check my cervix, my stomach plummeted. I willed my body to relax, but that was hard to do with a clenched jaw and rigid limbs. Does she know my history? As she examined me with her fingers, another contraction enveloped me and I almost lifted off the table. “You’re 7cm,” she said. She put her hand on my thigh in a gesture of comfort but it was more than I could bear.“Let’s get you back into the tub.” She wanted me to continue without the epidural? I was met only with kindness. She took her hand away gently. “Of course. This is your birth.” She stepped aside. It takes time to get an anesthesiologist in the room. Even though anxiety began to loosen its grip on my brain, the contractions just continued to get deeper and stronger. I didn’t realize at the time I had already entered into transition. The anesthesiologist was kind, and I didn’t care about the big needle he wielded. I just wanted the pain to subside so I could stop feeling so afraid. As the drug began its work, I lay my head back on the pillow and for the first time since my waters broke I felt calm, centered, confident. I felt like I was floating, my mind separate from my body. I welcomed the warm ease it brought me, and I allowed myself to sink deeper into the bed, relishing the feeling of cotton against my skin. About thirty minutes after the epidural began its drip, a slow ache began on the right side of my abdomen. Within minutes the ache had become a pulsing burn: the contractions were stronger than ever. Panic returned. What if they couldn’t fix it? What if I had sacrificed my desire for a medication-free delivery only to feel the pain? What have I done? The anesthesiologist returned and placed the needle in a different spot. My left leg became so numb I couldn’t lift it from the bed. The pain in my right side subsided but was still present. I rested for a little while and when they returned, I was fully dilated. The pain was still there. Muted, but present. I hated it and loved it at the same time. Birthing a child is supposed to be painful, and there was a part of me that was thankful for the slow, intense burn that reminded me my son was ready to enter the world. The pain would guide me. I was ready. I opened my mouth and roared my little lion out. My furry little cub, filthy but otherwise healthy and strong, opened up his lungs and roared right back. This post originally appeared on the Good Mother Project. → How Do I Want to Show Up in the World?